Brandwatch—the global social media monitoring firm—has just published a comprehensive study that delves deeper into the current state of Twitter. 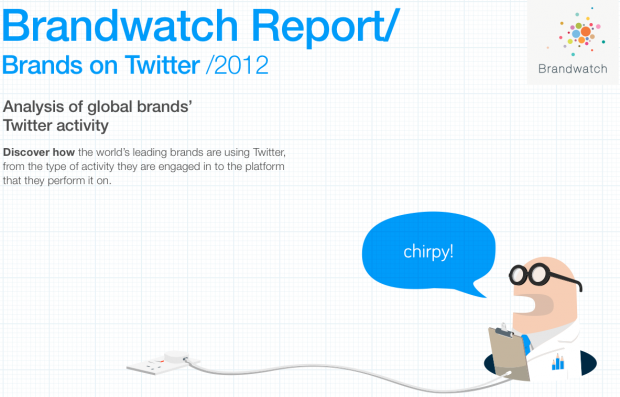 The report details how 258 of the world’s leading brands are using Twitter in 2012, from the type of activity they are undertaking to the particular tool they are using for publication. If your business isn’t on Twitter, it should be. Of the 258 businesses surveyed, only 9% DON’T use Twitter. And that number is progressively shrinking. Even for executives who were initially non-believers, social media has become serious business. More than 80 percent of executives now believe their brands can get more sales and bigger market share by using social media, according to a 2012 report from the Economist Intelligence Unit. Twitter lets companies take customer service to a whole new level. 75% of companies use their Twitter accounts both to broadcast and to engage with their audiences. And more and more businesses are using multiple Twitter accounts to interact with their followers. Take Britain’s National Rail, for example, which now has a whopping 27 Twitter accounts. The reason: Companies are realizing the advantages of using unique channels to engage different demographics. Listen more effectively, and learn to respond to your customers so your brand isn’t lost in the noise of the social web. Read this Info Sheet for tips on how. More isn’t necessarily better? Brand accounts are tweeting notably less frequently than they did in 2011. 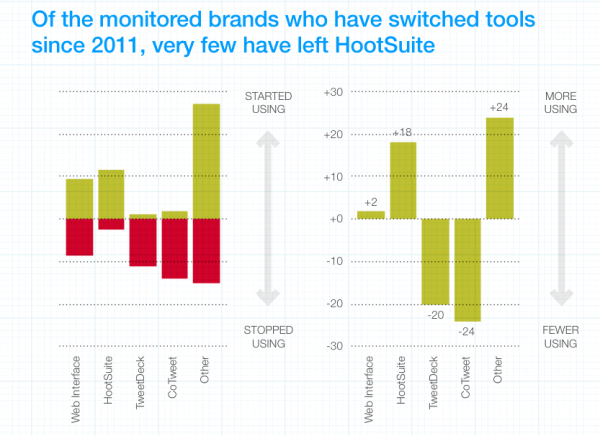 In 2011, half of the 258 monitored brands tweeted fewer than 19 times per week. In 2012, half tweeted fewer than 7 times a week. Rather than inundating followers with dozens of daily tweets, companies are sending out fewer, more fine-tuned messages to specific demographics. In other words, applying Twitter is increasingly a science, involving precision analytics and targeting. To maintain a successful brand presence, you should definitely be on Twitter. Engage with your audience using multiple accounts targeted at distinct demographics, instead of using a shotgun approach and blasting everyone with the same content. And take advantage of analytics to decide who to tweet, when to tweet and what content resonates with your followers. Most importantly, if you haven’t tried HootSuite yet, it might be time to do so. The data speaks for itself. With one tool, you can manage all your social accounts from one dashboard, schedule Tweets and updates in advance, get instant analytical feedback and more. See HootSuite plans, FAQ, and more here. Sign up for a free account.